Since its advancement, social media has drastically changed the way brands interact with their potential customers and vice-versa. Today, this counts as a critical part of a businesses’ digital marketing strategy. As one of the pioneering social media agency in Mumbai, Eduavenir has played a major role in the adoption of social media as a marketing strategy for businesses. As a real estate company digital marketing expert, we know that social media marketing is all about making your presence at the right place, at the right time, with the right audience and the right message. Our social media marketing services company helps a client in reaching their target audience in a way that accelerates performances and makes us one of the prominent social media marketing companies in Mumbai. Whether you’re looking to generate leads, improve sales, or build brand awareness, we customize our process to meet your needs. Posting on social media is fairly an easy task, but doing it well requires a careful thought. 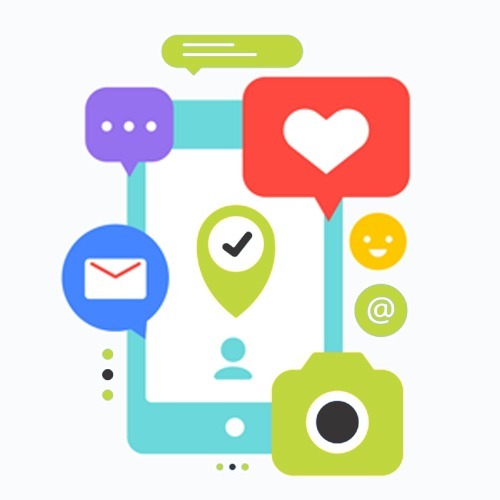 We consider the optimal way to connect with your audience with social media marketing services in Mumbai so that your visitors grow, engage and eventually convert. We are a social media marketing service providers in Mumbai and we pride on our team of social media specialists who possess the expertise to build and endure the presence of your brand in the industry. We offer expert account management services on every social media platform including Twitter, Facebook, Instagram, and LinkedIn. Eduavenir’s account management services will support you to utilize the unique capabilities of each of these platforms to connect with your target audience. There’s a need of context for any sort of content work. As a part of social media marketing strategy, Eduavenir Mumbai, believes in generating opportunities for deeper engagement, quality interactions, and greater reach with the target audience making use of high-quality content tailored for different social media platforms used by your brand. Want to communicate your story through the people who matter the most to your audience? In this digitally led era, it’s not about what you say but about who’s saying it. We, as a Mumbai based social media agency strongly believe that the concept of influencer marketing is fast becoming one of the most significant aspects of brands’ marketing strategies. Be it attracting audience, nurturing leads, engaging with them, or driving conversions, we carry out a range of tasks that help the customer move further into the sales funnel with successful outcomes. Right from management, advertising, posting scheduling, to page creation, page optimization, and monitoring, there are a wide array of services we offer as one of the best social media marketing companies in Mumbai. Our experts have a strong network of influencers to make sure that we find the right set of people for your business. Tailored to your campaigns and needs, we can find the ones with an enormous reach with highly niche followings. Partner with Eduavenir Mumbai, a social media agency, and also a one-stop destination for a comprehensive social media strategy, for the best SEO services or as e-commerce website developers. We function beyond making tall claims and delivering what our clients seek to sustain cut-throat competition and succeed as a champion in the long-run. Get a social media presence that complements your corporate theme and core values to the max. Spread a consistent message on digital media. We set up targeted social media campaigns. It focuses on the brand persona, audience profile, and the theme behind the message being conveyed. Get rich detailing and superior visual appeal with social media banners, images, videos, and text content meant just for you. Our business consultants provide total assistance in the development of high impact social media campaigns for a range of platforms. Get holistic support in creating targeted ads that appeal to the sensibilities of your audience. Generate better revenues through our exclusive SMM services.